Richell's Best Gate Yet! 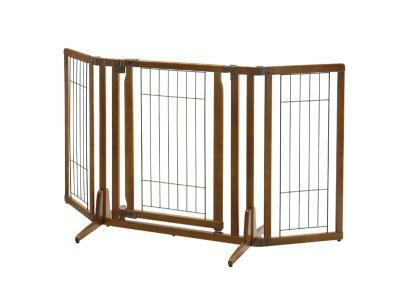 Our ever-popular freestanding pet gate is now higher, includes a walk-thru lockable gate door, and adjustable side panels! 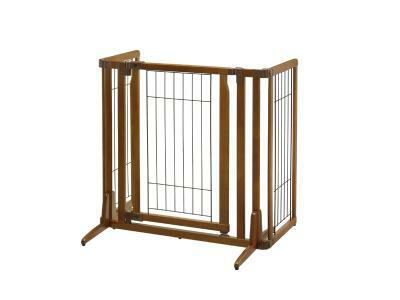 Richell’s new Premium Plus Freestanding Pet Gate with Door fits doorway and hallway openings from 34” to 63” wide! Plus, the specially designed walk-thru door opens in both directions and includes an upper/lower locking system allowing free movement and extra security! However the best benefit yet is the specially designed Side Panel that adjusts in increments of 10° to allow you more options for use in your home! Simply adjust the gate to fit your personal needs! Last but not least, eco-friendly wood complements home interiors beautifully! It doesn’t get much better than this! 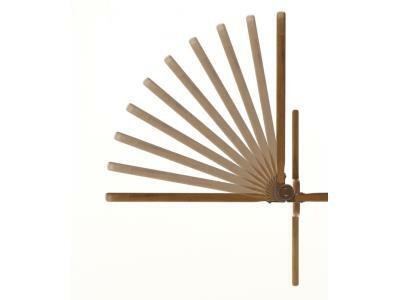 Designed to fit doorway or hallway openings from 34'' to 63'' wide. 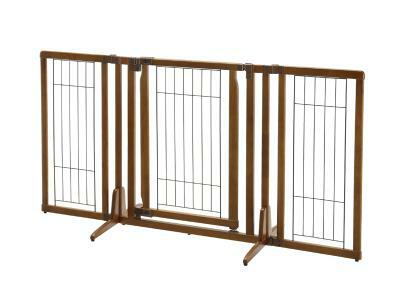 Gate stands at 32'' high to accomodate larger size dogs!